This walk was made on 17 July 2011 by about 40 people, some of whom had personal experience of squatting in the London Fields area of Hackney, London, from the 1970s to the present. It was researched and organised by Past Tense and Melissa Bliss with contributions from others. This seemed like a good time to highlight the squatting history of the area: the government had recently signalled its intention to criminalise squatting; the Olympics, only12 months away, has led to an increase in property speculation; and the London Fields area is experiencing rapid social and structural change. We selected 8 sites on the walk which showed different aspects of squatting in different decades. There were many other squatted sites we could have chosen so this walk is not comprehensive. This account is not comprehensive and we are looking for more information about this area. Squatting in London Fields goes back decades. The earliest references we found were in the late 1960s but it is likely there was individual and organised squatting before then. By the end of the Second World War Hackney had lost about 5,000 homes and 7,000 people were on the housing waiting list. The London County Council (LCC) accelerated its slum clearance programme, buying up properties and moving people out of London. The Metropolitan Borough of Hackney used compulsory purchase powers to buy up properties which had been requisitioned during the War: 1,767 properties, containing 3.317 homes, including around the west side of Mare Street . Hackney's population has declined since the 1910s until 1981. Between 1931 to 1961 it declined by about a third .Despite this there was also considerable homelessness due to poor housing stock and rising rents. Organised squatting increased in the 1960s. During the 1970s there were continual struggles around housing centred on homelessness, slum clearance and redevelopment plans. Rapidly rising house prices in the early 1970s led to a shortage of cheaper private rented housing and speculators leaving properties empty. The Greater London Council (GLC) and London Borough of Hackney (LBH) had plans to develop the Broadway Market and London Fields east side areas respectively to preserve local employment. But they proceeded so slowly that the areas were blighted and many properties were left empty. Squatters moved in. Organised and individual squatting increased. Public sector landlords and property owners responded in a variety of way: smashing up properties, licensing squatters or encouraging squatters to regularise themselves in housing co-ops or housing associations. Smaller changes like the removal of caretakers from housing estates by the early 1970s allowed squatters to move into flats undetected. From the mid 1970s the GLC took some moves to regularise squatters by getting them to form housing coops. In 1977 the Conservatives regained control of the GLC and started selling their housing to individuals through the policy of homesteading and housing associations. They also gave squatters an amnesty and offered them tenancies in hard to let properties. In the 1980s LBH suffered a number of crises including sever funding cuts from central government and, perhaps most crucially, when GLC was abolished, being forced to take on the GLC housing stock, much of which was in poor repair. This doubled LBH's housing. Cuts in funding from central government and internal council crises meant the council was unable to deal with its housing. In 1981 Hackney had 2,300 empty properties. During the 1990s the Council was able to regain more control over its property. Many homes had been lost to right to buy and funds were coming through from central government and the European Union to redevelop the area. In the 2000s squatting continued in the area but in a less organised way and more commonly in industrial buildings. As the area became gentrified, land values increase and less properties were available for squatting. There were also occupations in protest at the ways in which regeneration was being brought about, in particular with the sale of Council properties to property developers and speculators. Squatting continues in the area but mostly in building awaiting redevelopement, often from industrial to residential uses. The Lido was built 1932 by the LCC, partly as compensation to Hackney for military use of Hackney Marshes during the First World War. Like many other lidos in London it lasted well till the late 1970s when it was transferred by thy GLC to LBH .t It hen began to be run down by the Council, closing finally in 1988 amid plans to turn it into a car park. In 1990 Tower Hamlets managed to bulldoze Victoria Park lido and replace it a car park. This spurred local people on to continue to fight to save the Lido, even standing in front of a bulldozer in 1990 to prevent demolition. Local people led campaigns to reopen the Lido and cleared away vegetation. The children's paddling pool which was closed in 1999, was reopened by local people for summer seasons. In 1998 the Lido was squatted for housing, a café and communal events. In August 1988 there was the Carnival of the Dispossessed, a benefit for Reclaim The Streets. The Lido was squatted for a second time 2002-2005. A nice story of that time from Ms Marmite Lover. LBH, rather late in the day discovered an enthusiasm for the Lido and finally reopened it in 2006. it is now a source of pride for the Council which uses it frequently to promote the borough. But it would not be here now except for the concerted campaigns by local people and squatters. Well I was squatting in 64 Brougham Rd from 1974-1980. I was a postman in Islington. The house was very run down, with an old outside toilet and a sink for a kitchen. But we decorated the inside with posters, murals, press cuttings and inspiring slogans etc. I shared the place with Alan, a really decent and quiet young bloke who became an alcoholic in the late 1970s. Alan once got nicked when drunk at a train station wearing my post office jacket and wheeling about a post office trolley with bags of letters on it. This led to a raid on the house and some laughable police hysteria about him and me being in an anarchist train robbers gang... I testified in court that I had known nothing about it (and that probably nor did Alan), but he still got 6 months suspended (Mentioned in Albert Meltzer's autobiography). After I left I think he went downhill, and last I heard he tragically got run over by a bus. The other bloke we shared with was Des Kelly from Ireland who I recall was writing a book... I have a mad photo of him trying to ride his bike UP our staircase. I did bump into him in Hackney 15 years later but cant remember what he was doing them. There was a very strong Broadway Market Squatters Association (with maybe 50+ homes in it from the area) which met regularly for mutual solidarity and campaigning. I remember we decided to boycott an amnesty offered by the GLC (London Authority) to squatters if we would accept licenses... the Association saw it as a sell out and divide and rule - we were all pretty militant and independent. But eventually many did accept licenses and then formed housing co-ops in order to keep together and survive. There were lots of radical feminists in the area, many squatting - I admired them a lot. Some were involved in the Women In Manual Trades group. Former German urban guerrilla Astrid Proll did apparently spend some time in the area and many people in the area helped form the Friends of Astrid Proll to campaign for her after she was arrested. I think a building which had been squatted at the south end of the street sometime in the early 70s became a collectively run playcentre.. There was a good community, with squatters, tenants, feminists, anarchists and all age groups and nationalities all mixing and getting along pretty well. 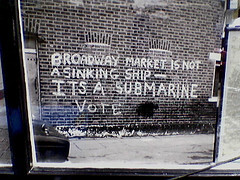 There was famous graffiti on a wall at the end of the street by the market which survived for over 10 years: 'Broadway Market is not a sinking ship - its a submarine.' It has been restored in recent years, but unfortunately gentrified a lot. It was amazing to go back there last year after decades away and visit Tony's cafe which had been there when I was there I think, been evicted in order to be ponced up, and then re-occupied as a high profile squatted political centre opposing gentrification in the area (by some anarchists and 'Hackney Independent' activists.. see the Hackney Independent website for full info on this). At some point the streets west of London Fields passed into the hands of the GLC - possibly after the Second World War. The GLC has plans to redevelop the wider Broadway Market area to encourage employment but left properties empty for a long time. The east side of Brougham Road was squatted from at least the early 1970s. Some became licensed through Patchwork Housing. A building was occupied and run as a nursery by a black group, becoming the Market Nursery, whose patron was Benjamin Zephaniah. The Market Nursery is still going is Wilde Close. Behind Brougham Road was the old Dalston Bus Garage (on the site of a military barracks) which closed in 1981 and was replaced by Ash Grove bus garage. The bus garage was occupied by travellers in 1981-82. This area was later redeveloped as housing by LBH: Suffolk Estate (1960s-1971) and the Regents Estate (1980-88), Grand Union Crescent & Dublin Avenue (1980s). LBH approved the GLC's development plans for the Broadway Market Area in 1975 but not much happened other than the building of Ash Grove bus station on Mare Street and Ada Street Workshops (1992). Walk along Brougham Road and Benjamin Close to Broadway Market. No. 34 is straight ahead, No. 71 is to the left. Broadway Market used to be a thriving shopping street and market. This declined until the 1970s when many of the shops were closed and the properties shuttered with corrugated iron. Some of the properties were owned by the GLC and LBH but some were privately owned (for example, in 1983 Prudential Insurance owned no. 53-61). The GLC's plans to develop the area stopped other development happening. Flats in the blocks around Broadway Market were also left empty, rented under the hard to let scheme and squatted including Warburton House and Jackman House. The Council has various schemes to revive the area but little came of them. The GLC built Ash Grove bus station on Mare Street and the Ada Street workshops in the early 1980s. In the early 2000s LBH was determined to revive the area by selling of the shops and flats above. Some leaseholders were able to buy their properties but many were sold at auction to overseas investment companies at less than market prices. Two sales were particularly contentious. No.34, Francesca's Café, was run by Tony Platia for over 30 years. He asked the Council if he could buy the property several times but was turned down. In 2004 the building was bought by Dr Roger Wratten along with the properties on either side of the café and other properties and land in the local area (including 2, 4, 6, 30, 32 Broadway Market; land to the rear of numbers 26-36 Broadway Market; 27 Marlborough Avenue). It seems that Wratten grew up in No. 36 next door. Tony was evicted at the end of 2005 and the property was occupied to prevent the building's demolition and as a protest against the wholesale sell-offs. The café was finally evicted in February 2006. Tony now runs a juice stall in the market (which started in 2004). No. 34 still stands derelict. No. 71, Nutritious Food Gallery, was run by Spirit who lived above with his family from 1993. When he starting renting it from LBH, the building was semi-derelict and he spent his own money doing it up and running a successful food shop. As leaseholder Spirit should have been given the first option to buy the property. But in 2002 when he went to the auctioneers and left a cheque he believed he had bought he building. But it was later sold at the auction to an offshore investment company than for less money than he had offered. This company then raised his rent by 1200% with the clear intention of getting him out. Spirit attempted to pay this rent but ran into arrears and was finally evicted in October 2006. 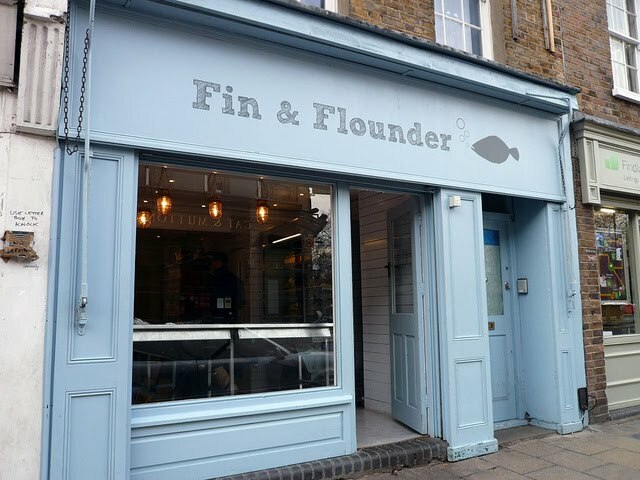 No 71 is now the FIn and Flounder. The Warburton Estate is typical of several estates in the local area (like Goldsmiths Row and the Haggerston Estate). Under the GLC it became run down and flats emptied. Some were squatted and some were let under the Hard To Let scheme. Sidworth Street was the site of a V2 bomb during the war and in the 1960s and 1970s industrial unties built. In 2010 one block (13018) was squatted as Urban HapHazard Squat. Some building around Sidworth Street and Mentmore Terrace are currently squatted, some with the knowledge/permission of the property owners. Properties round here bough by local council after WW2 (bomb damage & slum clearance) and in the 1970s. During this time there were several traveller sites on Lamb Lane, Gransden Avenue and Mentmore Terrace. In the 1980s a site on Gransden Avenue/London Lane was being considered as a permanent local authority traveller site. This building was built in about 1697, probably for a wealthy merchant, Abraham Dolins. It is the second oldest house and third oldest building in Hackney (after St Augustine's Tower and Sutton House). For the first 160 years (1697-1860). It was a merchant's family home. For the next fifty-odd years (1860-1913), like many big houses around this area, it was turned over to institutional use. It became the Elizabeth Fry Refuge for Reformation of Women Prisoners. It housed women released from jail where they learnt the skills to go into domestic service. For ninety years (1913-2004), it became a liberal/radical social club - the New Lansdowne Club. During this time a new building was built out the back with a bar and a stage. After a long period of decline it finally closed in 2004. In 2005 it was bought for a Vietnamese community and cultural centre but stood empty since then. In 2009 the building was squatted as a very active social centre. Events included London Free School, benefits, skills sharing and film nights. In May 2010 this company went bust and ownership passed to the Dunbar Bank which finally evicted the centre in August 2010. Currently (July 2011) on sale for £1 million. Currently squatted and open on Sundays - we dropped in to get dry, drink tea & play music. An ex-diving shop, it is now owned by property developers. The Victorian terraced housing in this area was not built to a very high standard. After the Second World War the Council compulsorily purchased some buildings in the area. In the mid 1970s LBH planned to create an Industrial Improvement Area between Mare Street and London Fields in an attempt to stem the loss of employment. The Council compulsory purchased more buildings and got rid of existing residents and businesses. It was not keen to hand housing over for short life in case it slowed down development. Squatters moved into the empty buildings and travellers into the yards (the earliest reference we found was to 1979 but may have been earlier). Artists organisations Acme and Space persuaded the Council to hand over some buildings for studios and living but many of the other properties were squatted. Space leased a building in Martello Street since 1971 and Acme had buildings on Martello Street and Mentmore Terrace. In 1985 the Council proposed demolishing all the buildings in Ellingfort Road, London Lane and Mentmore Terrace. Between 1885 and 1992 some of the short life housing co-ops left and more houses were squatted. In 1995 the Council announced its intention to create a fenced off industrial area between Mare Street and the railway, taking in London Lane, Ellingfort Road and Mentmore Terrace. In 1997 the Council got EU funds for this scheme but it was bitterly opposed by local people who wanted a mixture of housing and small scale workspaces. Some of the squatters had by now acquired ownership of their properties. Some of the people living in the two streets, both squatters and people in housing co-ops, got together to form a housing coop to take on the redevelopment. In the end eight houses were handed back to the Council for development for live/work units and the rest remained as a co-op. A former resident said "21 Ellingfort Road was the home of two Sisters of Perpetual Indulgence, Sister Belladonna and Mother Mandragora. Sometimes they hung out on the street in full habit and no one batted an eyelid and came home on the 55 bus in full habit too. We once went to the 'pub with no name' next to the hackney empire in full habit to a gig". Possibly originally Mothers' Hospital of the Salvation Army 1884-1913, then a Mission Methodist Hall. In1995 and1996 it was squatted as a social space: Spikey Thing With Curves. A large mural was painted on the outside and parties were holed there.